Tips for hosting a fabulous holiday party. Former Edina resident Cari Erickson often enlists Piram to assist with organizing dinner parties, baby showers, birthday celebrations and holiday parties. 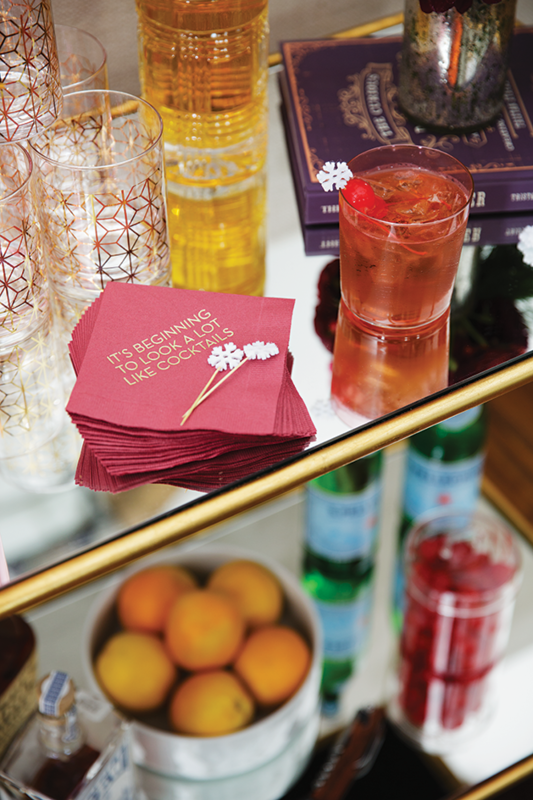 Steady holiday obligations can leave party-goers feeling less than merry and bright, but Erickson says Piram’s events feature surprise elements that keep everyone wondering “What’s next?” “At the parties Lindsay does, everyone knows to stay,” she says. Planning a successful party is like writing a good story; it begins with a theme. Piram says developing an event around a singular idea is a tremendous advantage. “I think that really sets the parameter for you, so you don’t try to do too many things,” she says. Erickson employs the “opposites attract” theory when it comes to some of her holiday gatherings, including her Naughty and Nice party, which Piram helped orchestrate a few years ago before she opened her own business. For the first part of the evening, guests were treated to a 1950s-themed celebration, complete with carolers, champagne cocktails, deviled eggs and hot toddies. As the evening progressed, guests were directed to the home’s lower level, which was decorated and lit in red, and finger food included a decidedly naughtier fare of nachos, sliders and a chocolate bar. While successful entertaining never goes out of style, trends do swing in and provide new takes on former notions. “People are ready to take their minds off things,” Piram says, noting guests and hosts alike are embracing formality. “If you’re ever going to get away with that, it’s over the holidays,” Piram says. “I’m seeing small dinner parties and embellished cocktail parties,” she says. The return of the cocktail party, modernized to feature craft beer and cocktails with seasonal ingredients and fresh herbs, makes a holiday splash. “You can really up the ante with the cocktails,” Piram says. Don’t get overwhelmed, she cautions, with the current large scope of retro and new beverage concoctions. 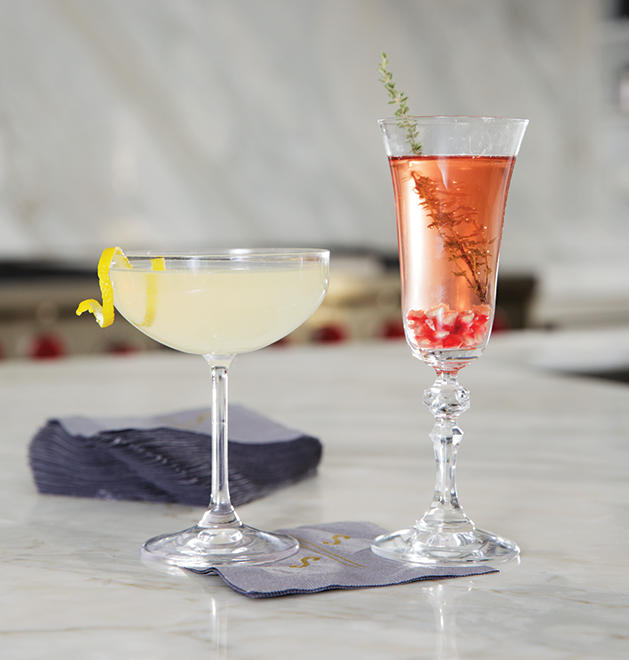 “Do a couple of cocktails really well,” Piram says, suggesting featuring an old fashioned beverage cart or a Manhattan station. Entertaining around a theme needn’t require dipping too deeply into the party budget. Piram advocates utilizing items from home. “Repurposing what you have in a clever way goes a long way,” she says. 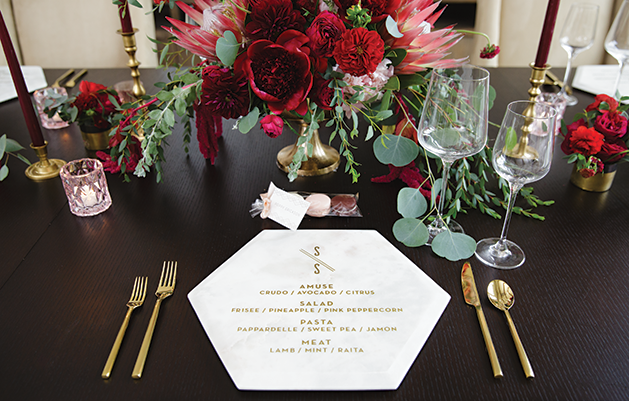 While developing a tablescape can be a source of concern, don’t fret, Piram says. “The retailers have been winning on this,” she says, explaining that there is no need to purchase completely new elements year after year. Add a few items, if needed, to refresh the centerpiece; that can include heading to the market for seasonal fruit or greens and herbs for a boho- chic vibe. Imagination can stretch the holiday dime even farther, and Piram suggests using vessels, receptacles and planters in unexpected ways to create clever presentations. Using nontraditional colors during the holiday season can add unpredictable elements, too. While silver and gold or red and green are the tones de rigueur, Piram has another idea for this season—rose quartz. “Just because it’s the holidays, don’t be afraid of fresh florals and pink,” she says. “As long as it feels good to you,” Piram says. Anything goes. Piram, who assists clients, many of whom are Edina residents, in imagining, creating and enjoying their celebrations, has some go-to vendors, which she says can help hosts and hostesses find special touches and inspiration. Piram recommends Sadie’s Couture Floral and Styling, noting that her staff works with a wide breadth of budgets, and Linen Effects, which has its finger on the pulse of home entertaining, as it provides a broad scope of items for weddings. “Whatever happens in weddings trickles down to home entertaining,” Piram says. She also utilizes West Elm, which features a holiday line including ornaments, and plenty of serving pieces to complement any collection. Perhaps the best place to procure décor items is right at home. Piram highly recommends adding personal touches, including using family recipes for the menu, showcasing heirloom serving pieces and dishes, or displaying treasured holiday cards in frames. All the party planning and attention to detail mean very little if guests don’t feel the genuine warmth of a well-thought out welcome upon arrival. Piram says guests should feel tended to from the minute they arrive, and that can even mean providing easy parking or enlisting a valet for larger gatherings (consider a responsible high school or college-age neighbor). A coat check person allows guests to transition more easily into the home or venue. Next, there’s the age-old dilemma—shoes on or off? “I don’t think you should ask people to take their shoes off—half your outfit is gone,” Piram says. Provide a mat at the door for wiping off winter’s residue, lay down extra rugs or redirect foot traffic if needed, she notes. Piram says guests shouldn’t seek out food or beverages once they arrive and suggests featuring a table of starters near the entrance. She also recommends passed foods. “It makes people feel attended to and luxurious,” she says. Lighting, music and air temperature should appeal to the senses without interfering with comfort or conversation. Lastly, Piram says it’s all in the name—of the guests. Use the guests’ names frequently throughout the party, be it in introductions and conversations or personalizing party favors or place cards at a table. Making each guest feel welcome and comfortable is the key to a successful party, Piram says. Cari Erickson weighs in, saying that a great party can be directly measured by the hosts. “When your hostess is at ease, the guests are at ease,” she says. Don’t make guests search for food. Consider placing easy to eat starters near the entrance, like these delectable delights from D’Amico and Sons. Our thanks to Gretchen Berry Design Co. for stationery, signage and accessories; Sadie’s Couture Floral & Event Styling for flower arrangements; D’Amico Catering for cocktails and hors d’oeuvres and Cocoa and Fig for desserts.